The Palace of Tau was founded in the late 4th century on the site of a former Gallo-Roman house on the southern side of the cathedral. It is a mediaeval palace with the appearance of a fortified house. It was originally a bishop’s palace and subsequently an archbishop’s palace from the 8th century onwards. The monument became known as the Palace of Tau in 1138. The name refers to the Greek letter “Tau”, reflecting the property’s T-shaped layout. This capital T shape also evokes the shape of the early bishops’ crosiers. Following a fire in 1207 or 1210, the palace was rebuilt, and a two-storey palace chapel was added. 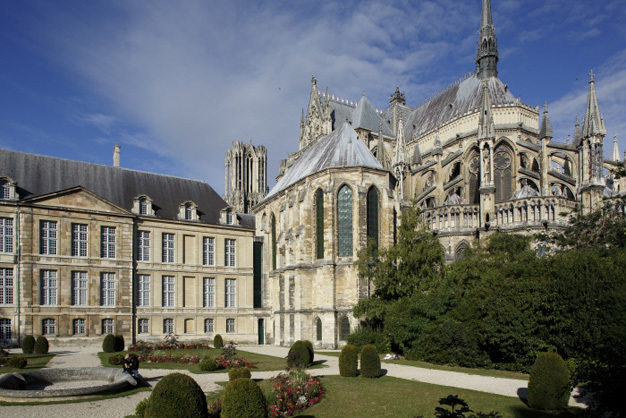 In around 1500, under the reigns of archbishops Guillaume Briçonnet (1497-1507) and Robert de Lenoncourt (1503-1532), the palace was reorganised in flamboyant Gothic style. Vestiges of this period can be found in the lower hall with its vaulted ceiling and beams and the décor of the Salle du Tau, recreated in the 20th century, with its hull-style wood-panelled vault. The building’s current, more traditional appearance dates back to the late 17th century. The work was conducted under the supervision of architect Robert de Cotte, during the reign of archbishop Charles-Maurice Le Tellier (1671-1710). The palace became public property in 1793 and was used variously as a court, trading hall, barracks and prison. The property was restored for the coronation of Charles X in 1825. In around 1860, the large perpendicular wing running along Rue du Cardinal de Lorraine was overhauled, based on plans by Viollet-le-Duc. Shortly after the expulsion of the archbishop, following the formal separation between Church and State in 1905, the palace became a national monument, and was listed as a Historic Monument in 1907. The buildings suffered significant damage during the bombing campaigns of the First World War and only the walls remained. The palace, which had housed collections of artworks and historical artefacts from the Champagne region since the 19th century, was subsequently restored and reorganised. It reopened as a museum in 1972. The palace, along with the cathedral, became a UNESCO World Heritage Site in 1991. Since 2000, it has been managed by the Centre des Monuments Nationaux, and was made accessible to disabled visitors in 2011.